Every year since 2008, ROI has designed, produced and annually overseen printing of more than 80,000 copies of the annual report for Danaher Corporation (NYSE: DAN), #162 on the 2017 Fortune 500 list. And, in 2016, Danaher spun off 20 of its operating companies into another, publicly traded company, Fortive (NYSE: FTV), already #420 on the 2017 Fortune 500 list. 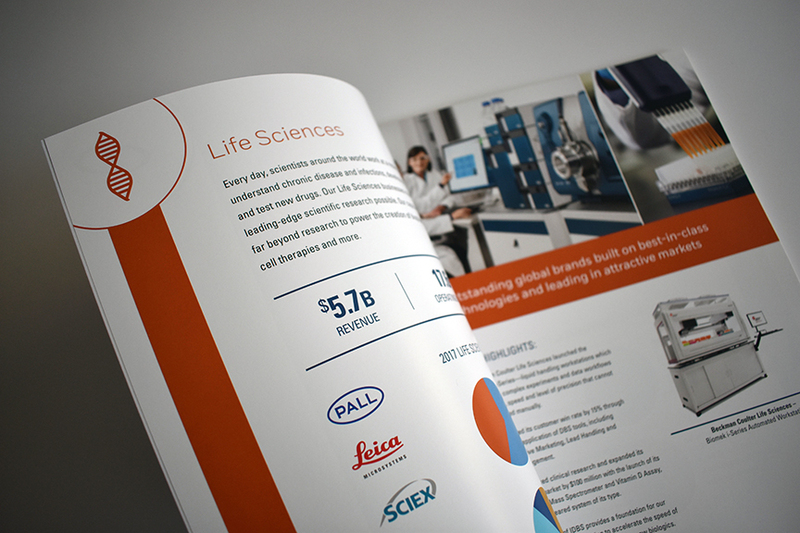 ROI also designed, produced and delivered the 2016 and 2017 Fortive annual reports. See them here. In 2018, working with our awesomely talented partners at Brave, a terrific, UX firm located in Downtown D.C., ROI also helped direct production of Fortive’s first, interactive version of the 2017 Fortive annual report. See it at at annualreport.fortive.com. Whew! 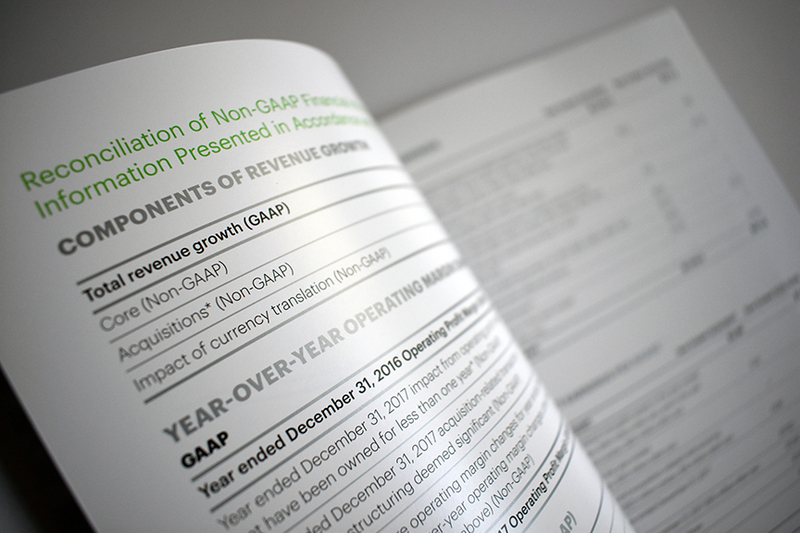 Two, Hardcopy Annual Reports Down; Two Interactive Ones To Go! For the ROI team January through March traditionally is a time to rock and roll on designing and producing annual reports. This year, we produced two; one for Danaher (NYSE: DHR; www.danaher.com), a Fortune 144 Company, and the other for Fortive (NYSE: FTV; www.fortive.com), a relatively new company, spun out of Danaher, yet still large enough to make Fortune’s next 500 list. 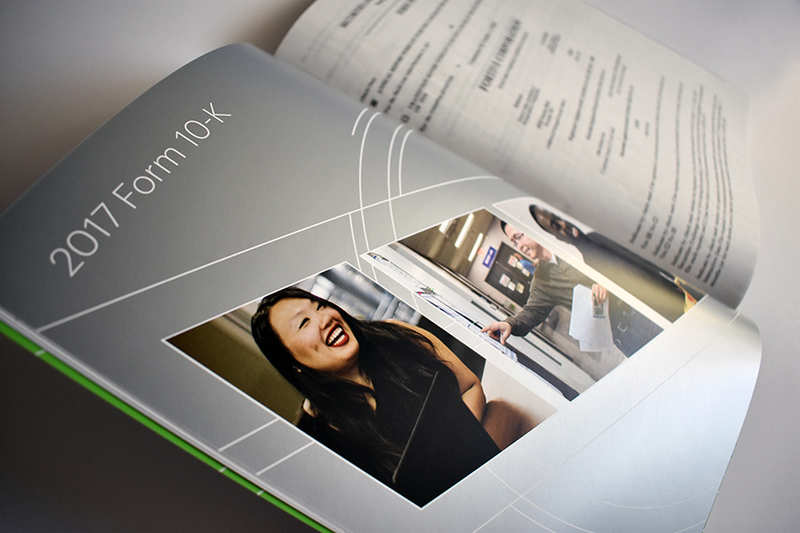 The annual report work, produced to perfection by ROI’s VP, Creative Director, Sean Causley, and art director Carolyn Belefski, takes a lot of talent, analysis and a lot of focused effort, since (per the SEC), both pieces have to be locked down, printed and in the mail by early April each year. And much of the data and analysis isn’t ready for primetime until late January. The results (pictured below) are two, exceptionally fine-tuned and spot-on branded pieces that both deliver essential information to the respective companies’ shareholders and set high standards for the fine art of annual report design. Next up: ROI’s collaboration with BRAVE (www.braveux.com), one of the nation’s foremost, UX (user experience) developers of interactive websites. Brave and ROI are collaborating on development of interactive sites that will bring both the Danaher and Fortive annual reports to life, enabling viewers to enjoy customized, graphically engaging, deep dives into the data and other information presented in the annual reports and otherwise of interest to shareholders, analysts and the media. Why is branding so important? And, by the way, what is a “brand strategy,” anyway? When people talk about “brand,” they’re often referring to what you can see: a logo, the color palette, typefaces and/or taglines. But, logos, colors, type fonts and taglines are mere signposts to a brand; “brand” is so much more than that. It's what sort of experience you offer and how you relate to customers. It’s even how your employees answer the phone. Best put, your brand is your company's/product’s personality, as perceived across your target marketplace. Brand is powerful – way more powerful than many will acknowledge. In a world or choices, it is what makes people prefer and choose one product, service on company over another. That’s true even when there are no, discernible, real differences when products are like coffee. The look, the price and the taste often are the same from brand to brand. That being the case, what influences the buying decision? Often, it’s what’s ON the cup – the name and the label. (Hello, Starbucks) Why? Because, through marketing, word-of-mouth and other influential media, we often identify with and prefer some brands over others – we become aware of and attached to them, because we see ourselves in their reflection; they make us feel something special, differentiated, signature about ourselves and our lives or about the impression they confer about us to others. Could a cup influence coffee purchase decisions? reliably – people feel that you deliver as promised. Your brand is really a reflection of your reputation in your broader marketplace, based on what past and present customers/clients say and feel about their interactions and experiences with you, your products, services and people. That’s why having a cogent, reality-based brand strategy is so essential to continuity of positive, brand awareness and success. Because your brand strategy is your holistic “battle plan” for making sure your customers continue to perceive and respond to your brand as you strategically want them to do. Getting a brand strategy together is usually the first thing we at ROI do for new clients. Sometimes (for an existing brand), the first step is a “deep dive” brand audit to help us and you understand how external audiences (past, present, prospective customers) and internal audiences (senior leadership, middle management, staff and other stakeholders) perceive and describe the brand and its attributes against what we learn from our own, dispassionate research. From that analysis we can see areas of consensus and disagreement and identify where we need to do “brand triage” to reach true consensus. you want your brand to go what you want it to represent in the future. Building that plan is a lot of work; but it’s essential work that will promote measurable success. By stepping back to evaluate and, as necessary, reorient your brand messaging, images, graphics etc., and to rethink your strategy, you’ll start building a strong(er) brand. And a good strategy will underscore and infuse everything you do with regard to marketing and sales with the smartest, possible thinking. We describe ROI with a wink as, “the agency that’s completely full of BS.” Of course, you know that we mean “Brand Strategy.” In a world where many are in (too big!) a hurry to get going and succeed, they often initiate out of sequence, “Ready, fire, aim!” marketing plans and tactics that fail to deliver. Conversely, we at ROI are wedded to a process-driven, “Ready, aim, fire” approach that follows time-proven steps toward measured success. We are firm believers in the foundational value of brand strategy, and we are ready, willing and able to help our clients develop and implement their own. ROI principal, David Nellis, recently returned from Richmond and meetings with the new members of the VALET (Virginia Leaders in Export Trade) class. VALET is a very successful, two-year, international business acceleration program run by the Commonwealth. It provides a world of training and assistance to developing exporters; that is, to Virginia businesses with firmly established, domestic operations and that are committed to international export as an expansion strategy. This award-winning program offers a powerful combination of capital resources provided by the Commonwealth and professional services from expert, private sector partners (referred to by VALET as trade partners). Only 25 companies each year are accepted into the VALET program, and the VALET program generates an average increase in international sales of 54% for participating companies. ROI was selected to serve as a VALET trade partner in January 2017 and is the exclusive, strategic brand marketing agency in Northern Virginia to serve in that capacity. It’s That Time Again: Our Annual, Annual Report Time! 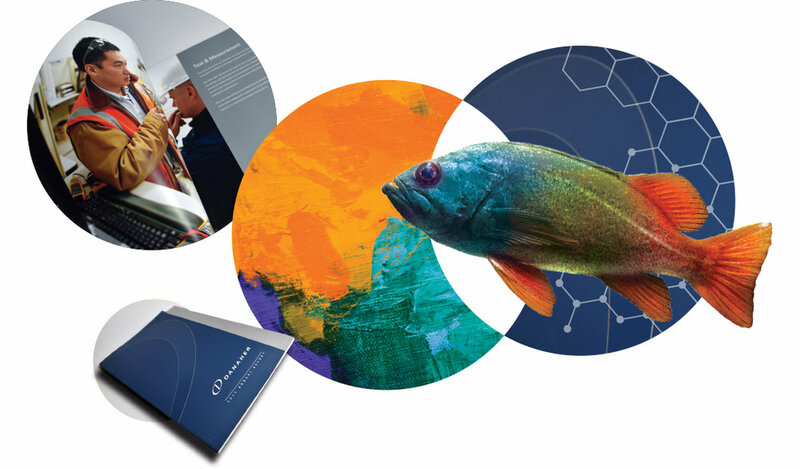 We are pleased to report that two of our publicly traded clients, Danaher Corporation (NYSE: DHR) and Fortive (NYSE: FTV) again have assigned design and production of their annual reports to ROI. 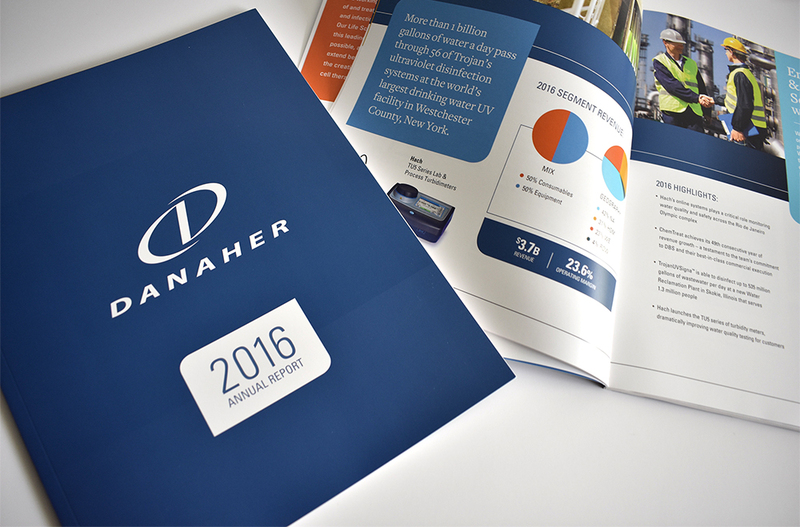 This is the tenth year we will have produced the Danaher annual report and the second time for Fortive. Annual reports are due out to shareholders the first week of April 2018. So, as you can imagine, we are hustling now to nail down concepts for covers and interior pages, so that the long design/copy process can move forward apace, in time for the March deadline for release of both publications’ digital files to the printer. ROI principal David Nellis was part of a three-person, CEO’s panel on social media marketing strategies and tactics, during the 69th Virginia Conference on World Trade, October 17-18, 2017, in Williamsburg. Speaking to an audience of some 200 senior leaders representing a spectrum of businesses across the Commonwealth, David and his co-presenters offered real-world insights into effective, social media strategies and tactics that could deliver measurable success, while also measurably eliminating wasted expense. The Virginia Conference on World Trade is an annual event bringing together the governor, senior, economic development administrators representing the Commonwealth and hundreds of business leaders to focus on developing and cultivating global, business partnerships and relationships that in turn create commerce. David was invited to speak, based on ROI’s signature membership in the Commonwealth’s esteemed, VALET program. Run by the Virginia Economic Development Program (VEDP ), VALET (Virginia Leaders in Export Trade (VALET) is a two-year, international business acceleration program. Program benefits include executive training, international sales plan development, educational events and customized research. This award-winning program offers a powerful combination of both capital resources provided by the Commonwealth and professional services from expert, private sector trade partners, one of which is ROI; ROI is the only Northern Virginia marketing agency serving as a VALET trade partner. In all, VALET generates an average increase in international sales of 54% for participating companies. 1. What do you remember about your first day working at ROI? There was a huge Mac on my desk, and it was intimidating. I am a PC person and had never used a Mac before. I told Elliot and David I would try to learn it but by day two, I had ordered a new PC. 2. Which song describes your career at ROI? 3. What is the most gratifying project you have worked on and why? 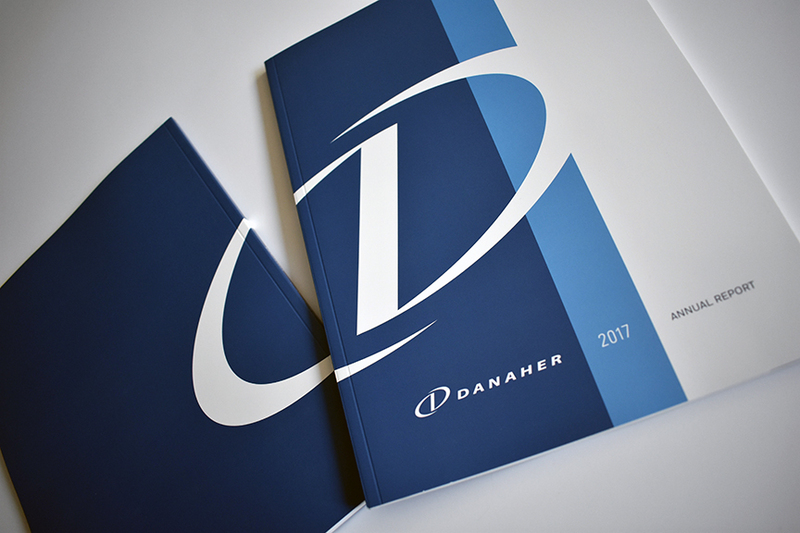 We’ve had some great projects over the years but I think my most gratifying one was our first Danaher Annual Report in 2008. Since coming on board with ROI in 2007, this project was my first significant collaboration with our creative department. One of my strengths is project management so to steward this from the design phase to final production several months later was very rewarding. It’s been a project ROI has been fortunate enough to work on every year since and I still enjoy it from start to finish. 4. How have you went above and beyond to assist a client? Does waking up at 3:00 AM to catch a 6:00 AM flight for an out-of-state press inspection count? 5. If you were a bumper sticker, what would you say? 6. What advice do you have for anyone looking to land a position in advertising? I guess it depends on where you are in your career path. If you’re just starting out, then my advice is to find an agency that aligns with your values. You’ll be much happier coming to work every day. I’d been in the workforce for many years before joining ROI so for me, at that time, it was critical that I found an agency that not only aligned with my values, but was also family-friendly. My son was five years old when I started and having flexibility was critical for me. Elliot and David have always been incredibly understanding about it and I am still grateful for that today. 7. In your professional opinion, what’s the worst name for a color? 8. What is your preferred office supply item? 9. How has working at ROI made you a better person outside of the office? I’ve gotten some good advice over the years from my colleagues. I’d like to think that advice has made me a better person. 10. What is your professional goal to achieve within the next year at ROI? To find someone else to go on those out-of-state press inspections. 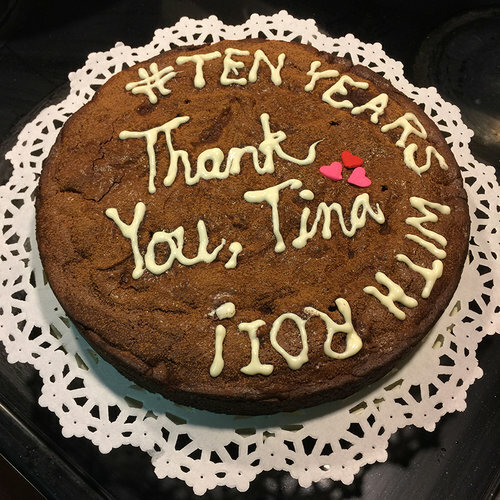 Umme made a gluten-free brownie cake for Tina's achievement festivities. Since 2008, ROI has been pleased to design and produce the annual reports for Danaher Corporation (NYSE: DHR), the Washington, D.C.-based company whose operating companies are concentrated in the fields of design, manufacturing, and marketing of industrial and consumer products. Happily, all have been well received by Danaher and its shareholders, and many have been honored by significant design awards. In July 2016, Danaher split into two, publicly traded companies, which moved Danaher companies focused on professional instrumentation and industrial technologies under the umbrella of Fortive Corporation (NYSE: FTV; Everett, Washington). 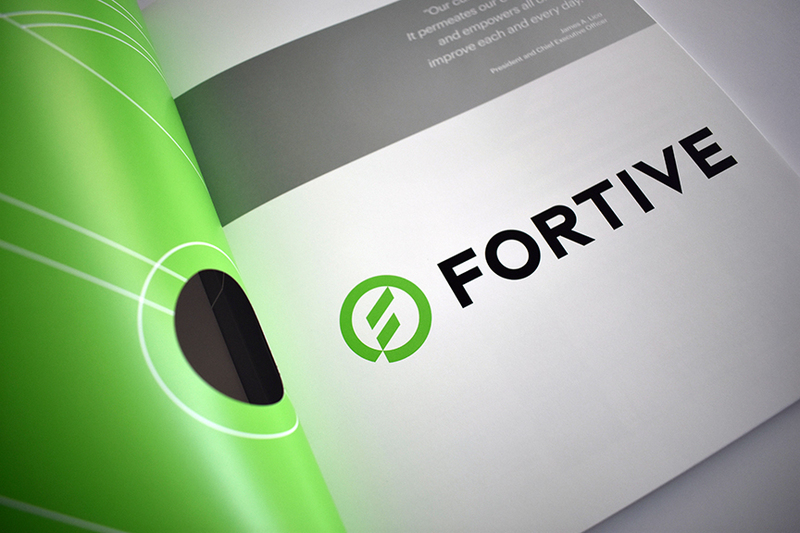 ROI also was pleased to be selected by the senior, investor relations team at Fortive to produce the company’s first-ever, annual report, covering business activities from July through December 2016. Churning our both pieces against tighter-than-tight timelines was a challenge well met by VP, Creative Director Sean Causley and Carolyn Belefski, all backed by the sage advice and calm shepherding of Production Director Tina Ashkouri.